YAOUNDE, Jul 22 2013 (IPS) - At the Garoua Regional Hospital’s Paediatric Feeding Centre in northern Cameroon, Aicha Ahidjo* is relieved to hear that her one-year-old son will survive. The child was suffering from chronic malnutrition, and other children have died of it. It has cost Ahidjo a lot to get her son Ahmadou here. Ahmadou showed symptoms of swollen feet and dry and thinning hair. The 30-year-old mother was forced to defy her husband and bring their son to hospital. The child had developed Kwashiorkor as a result of severe protein deficiency. “Some months after the birth of the child, I fell pregnant again,” Ahidjo, who is six months pregnant, tells IPS. “I had to wean him, but his father didn’t want me to give him infant formula. He discouraged me from continuing to breastfeed the child and told me to feed him maize porridge and rock salt.” She was powerless to refuse her husband. “I gave in, but after some time I noticed that the child was tired and his skin was thinning. I spoke to my mother who told me that these were signs of malnutrition,” she explains. 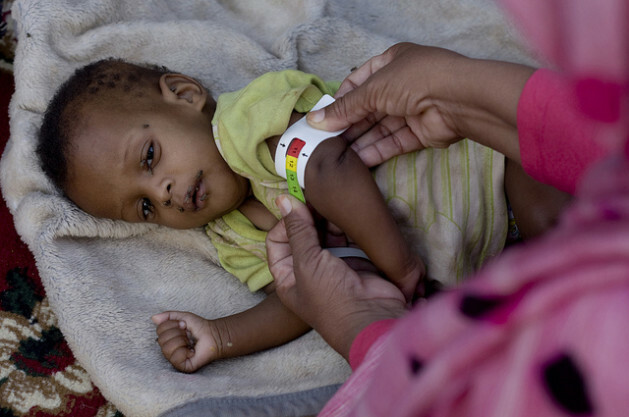 Ahmadou is not the only child at the hospital suffering from malnutrition. In June, the centre’s medical staff registered 31 malnourished children. Six died, one recovered and 21 were transferred to other hospitals. The remaining three children, including Ahmadou, stayed at the hospital for treatment. Six-year-old Haouwa Aboui* was the last child to die at this centre in June. Her 60-year-old grandmother, Maimouna Aboui*, sits in front of their home, fatigued and despondent. According to the most recent study by the National Institute of Statistics (NIS), published in October 2011, 33 percent of under-fives in Cameroon suffer from chronic malnutrition and 14 percent of them are severely malnourished. The community health division in the Ministry of Public Health believes that malnutrition is closely linked to Cameroon’s complex climate. In parts of the Adamawa, North and Far North Regions – a dry and semi-arid zone – nutritional deterioration is present among a large proportion of Cameroonian children and refugees, according to the ministry. In addition, the massive displacement of Chadian and Central African Republic refugees has added to the growing number of people unable to access food. The Far North and North Regions have the highest rate of infant malnutrition in the country because of a lack of food during the lean season, which lasts from mid-June to the end of August. Another contributing factor is the poor variety of foods consumed by the population, such as millet and sorghum. However, malnutrition is prevalent throughout the country, says Ines Lezama, a nutrition specialist at the United Nations Children’s Fund (UNICEF) in Cameroon. According to NIS, 44 percent of children suffering from chronic malnutrition in the Central African Economic and Monetary Community live in Cameroon. UNICEF estimates that 57,616 children under the age of five are at risk of severe acute malnutrition in the North and Far North regions of the country, and that 145,000 children under the age of five will have stunted growth. UNICEF, in conjunction with the government, works in 19 feeding centres in order to prevent complications. Dr. Joel Ekobena, a paediatrician at the Garoua district hospital, explains to IPS that they are increasingly working on prevention. But access to healthcare also poses a problem: 23 out of 43 health districts in the North and Far North of the country are short of qualified personnel. According to NIS, the two regions have 92 doctors for an overall population of 5.5 million inhabitants.